A guidebook covering some of Scottish paddling’s best kept secrets. Forty-five journeys are described in a way that is both inspirational and informative. Details of launching and landing sites, tides and potential hazards are provided and the coast is described in exquisite detail. This means that it can also be used as a kayaker’s ‘pilot’ for any journey they might wish to undertake in this area. 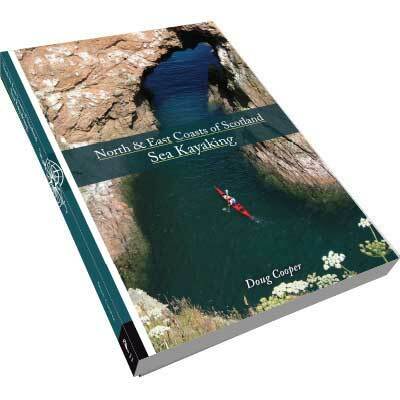 It follows the successful format of other Pesda Press sea kayaking guides, presenting the information in a user-friendly fashion and making good use of maps and colour photographs. The North and East Coasts of Scotland do not have as many sheltered water options as you might get on the West or in the Islands, and there is always some sort of swell, but if you make the effort you will be richly rewarded, by stunning cliff and coastal scenery, numerous bird colonies, and fascinating fishing villages each with their own history and character. Doug works at Scotland’s National Outdoor Training Centre, Glenmore Lodge, where he is Head of Paddlesports. He works as a Level 5 Coach in Sea and White Water and has the fantastic job of taking people to remote and spectacular coastlines and rivers, then helping them improve their paddling skills and understanding. Many of these days are spent on the sea on the North or East Coast of Scotland, which is a great office on work days and an even better playground on days off. Doug also enjoys pushing his envelope or just having fun on personal adventures and expeditions. He has sea kayaked extensively around the world including Greenland, Alaska, Iceland, Norway, Ireland, Corsica, Croatia, Sardinia and Greece, and always has a new destination and adventure planned. When not out on the water Doug can be found in the mountains at work as a Mountain and Ski Instructor or at play in search of new crags or fresh powder tracks. He was also co-author of Scottish Sea Kayaking and author of Sea Kayak Handling and Rough Water Handling; all published by Pesda Press. So if it involves discovering new remote parts of the world, having an adventure or helping friends and clients; then Doug will have a smile on his face and definitely be having fun. Excellent quality guidebook, highlights areas that should be known and paddled more than they are. When is comes to sea kayaking in Scotland the west coast tends to get all the attention, however, this guide might change that, as it reveals Scotland’s best kept paddling secret: the north and east coasts. Doug Cooper, Head of Paddlesports at Glenmore lodge and all-round sea kayaking expeditionary, shares forty-five of the region’s best journeys. Each route is described in detail, with a colour map and all the associated planning information, including start and finish grid references, tide times, distance and difficulty. The guide is illustrated throughout with beautiful photographs that show the coast at its best, and also prove that the east gets its fair share of sunshine and blue skies! If you’re looking for stunning cliff and coastal scenery, crumbling castles and picturesque fishing villages then this is the coast for you. This guide has all the information that an intrepid kayaker needs, in a user-friendly format and with plenty notes on points of interest, including wildlife, flora and fauna, and local history.